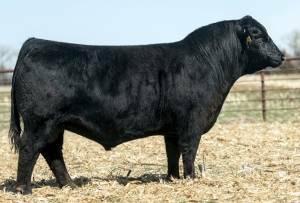 A featured highlight of the 2017 C Diamond Simmental sale and ET brother to the $30,000 Werning selection! Top percentage EPD rankings for CED, BW, WW, YW, ADG, DOC, MARB, REA, $API and $TI. An extraordinary phenotype with excelling depth, thickness, length and natural muscle. Particularly soft in his makeup, super sound structured and very easy to look at. Great feet and importantly free in his stride and movement. Three of the breed's most noteworthy, pinnacle females are represented in the legendary “8543U”, “82B” and “92Y” lead donors.